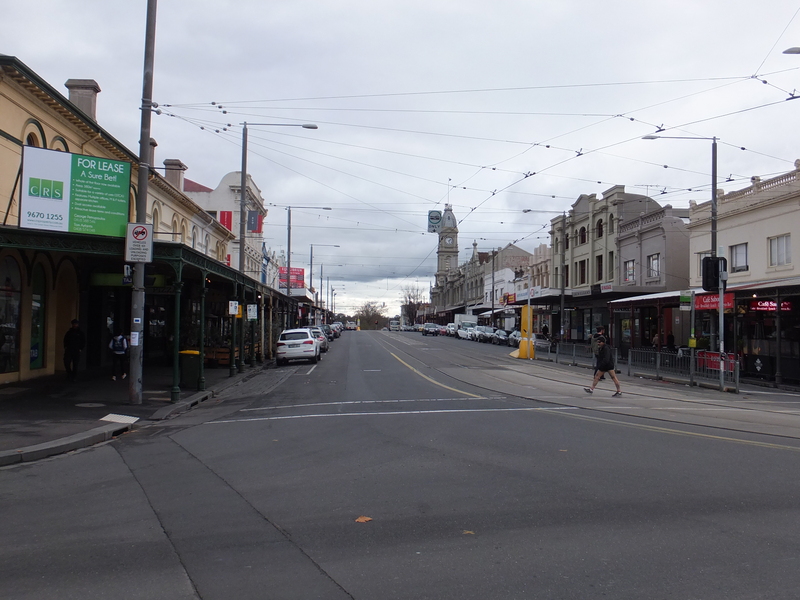 Unlike some inner suburbs (such as Abbotsford, Collingwood and Richmond) the North and West Melbourne area is characterised by its network of wide streets and distinctive historic buildings. It is a pity, however, that some streets are still dominated by vast areas of dark grey bitumen. This blandness has been partly alleviated with landscaping provided by the Melbourne City Council. Trees planted in grassed areas visually soften the harshness of the built environment, provide shading in summer (even over car-parking spaces) and a habitat for birds, create a breathing space for pedestrians crossing the busier roads, and reduce the extent of stormwater runoff into the drainage system. Some streets have even had safe cycle lanes installed (Abbotsford, Victoria and Queensberry streets, for example). Disappointingly, this does not apply to the main shopping precinct of Errol Street and the adjacent areas of Victoria Street and Queensberry Street where hard surfaces and tram tracks prevail. Here only two tall old scraggy trees act as sentries outside the North Melbourne Town Hall (one in Errol Street), while other larger trees are situated well beyond each end of the shopping strip. Most other inner-suburban shopping strips have trees planted at regular intervals along their length, extended kerbs that restrict car and truck access, and signs and road treatments that discourage speed. Some have even been transformed into pedestrian malls where locals and visitors can relax outdoors relatively free from noise, pollution and the danger of traffic. It is surprising to me that car drivers are able to tear through our main shopping centre on smooth surfaces while aged pedestrians and cyclists (l am in both categories) and parents with babies in prams have to negotiate uneven bumps and kerbs at the edge of the road or walk considerable distances to safety crossings and wait for the traffic lights to change. The CAN Report (the Citizens’ Action Plan for North and West Melbourne prepared by members of the North Melbourne Association in a proactive response to the City of Melbourne Strategy Plan proposals in 1973) recommended measures to improve our environment for pedestrians as part of a raft of sensible planning policies. One of these was limiting the amount of through traffic. Surely after 42 years it is now time to institute a plan to at least upgrade our street environment to augment the improvements to facilities already achieved, such as to the North Melbourne Library, the Town Hall Arts House and the neighbourhood centre in the historic Municipal Buildings. This can simply — and very cheaply — begin by planting trees along Errol Street in gaps between verandas or where they don’t extend out to the kerb line, with the loss of minimal car-parking spaces, and installing speed-limit signs of 40 km/h. This provision could later be integrated into a ‘landscaping improvement plan’ detailing various options developed with community participation. Options might include widening the pavement and incorporating planting around the town hall, installing textured paving to warn drivers that they are entering a ‘pedestrian preference zone’, and extending pavements to reduce walking distances at crossings. Planting trees would also help mask Errol Street’s poor appearance, which has been marred over the last 60 years by insensitive design of frontages that have not respected the scale and elegance of the older buildings. If such measures can be implemented successfully in other shopping centres, notably Kensington, Swanston Street and Bourke Street, why can’t it happen in Errol Street, making our own neighbourhood far more pleasant and safe? some inner suburbs (such as Abbotsford, Collingwood and Richmond) the North and West Melbourne area is characterised by its network of wide streets and distinctive historic buildings. It is a pity, however, that some streets are still dominated by vast areas of dark grey bitumen. Most other inner-suburban shopping strips have trees planted at regular intervals along their length, extended curbs that restrict car and truck access, and signs and road treatments that discourage speed. Some have even been transformed into pedestrian malls where locals and visitors can relax outdoors relatively free from noise, pollution and the danger of traffic.